Some people say that Hope was the cruelest of the demons that sprung from Pandora’s box, but without her we would never know how awful everything else is. This situation really inspired a lot of introspection as well as a lot of retrospection on my part. The bullying I dealt with in middle school was fairly intense. There were kids whose taunting was basically nonstop in any situation where adults were unable to see–the bus, the locker room, the halls during passing periods–and subtler but still extant even in class. The kids who didn’t torment me still made their general dislike known. I mean, I was wildly unpopular. My nickname among all but the small handful of outcasts who would even talk to me like a human being was “Anti,” because they were all against me. The entire grade was anti-Monica. Literally. Just swallow that for a moment. We didn’t have #ItGetsBetter in the ’80s. For all we knew, it didn’t get better. But I had hope that it did. I centered that hope around the idea that one day the world would recognize how awesome I really was, and that hope developed around my writing. That was my escape, not only into the future as I imagined that destined recognition, but my escape from the present, as I plunged into these sublime other worlds I could create to avoid living in the ugly mundane world that hurt me. The Fox and I sometimes talk about this the vast gulf between past and present. A talented kid enjoys the act of creation, takes pride in what she accomplishes, and sees perfection in everything she does. When you’re 12 years old and writing your way out of an almost intolerable life, you have great faith in the greatness of your work and its ability to float you over the rough times. When you’re 40 years old and have a master’s degree in your craft, you analyze everything. You critique your own work. You anticipate your critics. You take it apart and put it together backwards and agonize over single words and get your heart ripped out with every rejection. You recognize the potential to failure and the human frailty of art. But you never would have gotten there if you weren’t first a 12-year-old with an unquestioning belief in your own righteousness. First you have a butterfly, but as soon as you start caring how others will respond, you get a snake. The more I ponder this, the more I seek out this childish and optimistic way of existing in the world. 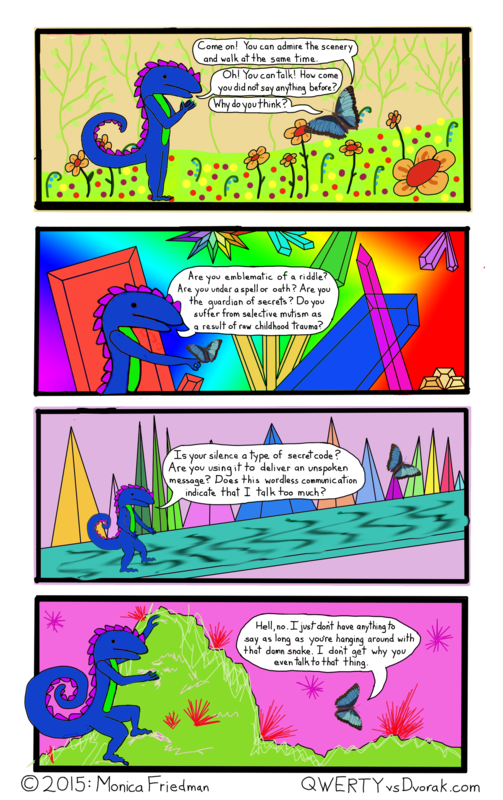 This entry was posted in Comics, dragon, Dragons and tagged bullying, butterfly, dragon, hope, memory on January 30, 2015 by littledragonblue. This mandala warms your spirit with the heat of a thousand very tiny suns. A lot of skew on this one. It’s unfortunate that I didn’t take any sort of notes during the mandala project. There are a few for which I can remember my exact inspiration, mindset, and/or intention, but for the most part, I have these charming designs whose origins have grown mysterious. Triangles and starbursts are a pretty common theme in this series, while dots are less common. One thing I am realizing, looking at this image, is that there is something gross stuck to my scanner. It’s on every image I’ve scanned for weeks. It would probably behoove me to clean the scanner, and to Photoshop the gross thing out of previously scanned but not yet posted images. There’s been so much new art going on around here that it’s been weeks since an old mandala has made it into this blog. Just now, someone posted that Kurt Vonnegut quotation about going into the arts onto my Facebook page with the message that my drawings were getting better. So Dragon was right, and, as we’re rapidly learning, the snake was wrong. You can, in fact, get better with practice. 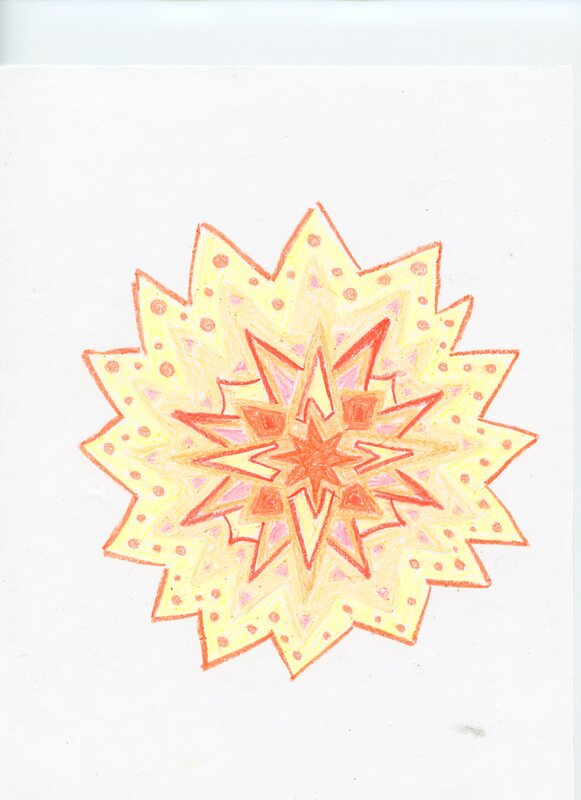 This entry was posted in mandalas and tagged crayon, mandala, practice, red, starburst, yellow on January 29, 2015 by littledragonblue. Don’t enjoy the sound of silence. A long time ago, a lot of years ago, I visited a Mayan shaman. I had been the victim of a violent crime and sought treatment for Post Traumatic Stress Disorder, and my therapist suggested I see this practitioner, who was a colleague of hers, for some more traditional healing. This shaman presented an intriguing mix of esoteric wisdom and childlike wonder. Before I even opened my mouth upon meeting him, he diagnosed me with an unrelated medical condition, which he then proceeded to fix. I’m not even making this up. I came to him for psychological help and somehow he intuitively knew about this other issue, and after the session, I did not have this problem anymore. At the same time, his treatment method involved copious quantities of tequila, some of which he ingested himself, and after our session, we fell to to talking, in the process of which he locked himself out of the house. Then he passed out on the porch. I relate this part of the story to highlight that place where brilliance and innocence overlap, where what can be great and astonishing can, at the same time, be small and ordinary. This guy was a metaphor for everything real in the world. We also took a spirit journey together, or, more accurately, he took a spirit journey and I sort of followed along. There were 4 main points of interest along the way, 2 of which made immediate sense to me, and 2 of which took many years to resonate into clarity. In fact, 1 of them really only started to take on meaning as I began writing this blog post. But the other one (and yes, here comes the point) regarded the butterfly, a symbol of transformation, but also a symbol of inspiration. Why does it mean to follow the butterfly, I wondered. It is to pursue that which is beautiful, but also elusive, but also metamorphic, meaning that the butterfly can initiate change. While slow human eyes might see a caterpillar as a separate creature, apart from the dazzling winged creature it will become, they are one and the same. The caterpillar is the butterfly; the butterfly is the caterpillar. The caterpillar may be an ugly little creature chomping all the leaves off your citrus trees one day, but after a brief period of transition, it’s a flying jewel. Everything is transitional, and everything has the potential for great harm, or great good. The tao of art isn’t some kind of garden party; it’s a trek through the jungle. Your guide is this ephemeral, elusive wisp: a butterfly, a muse, a feeling. An interior faith that an invisible compass points true; that the exterior magnetic compulsion is trustworthy. For me, this is the way of the butterfly. There’s the belief that the butterfly exists, that it is a real thing even though you can’t capture or contain it, and there’s the belief that the butterfly represents what you feel it should represent. In other words, there are 2 voices: the snake says “stop,” the butterfly says “go.” The snake crushes; the butterfly expands. The snake prevents; the butterfly compels. The artist has to own these creatures, and decide which one to privilege. One most likely yells rude epithets constantly, but most often when it’s likely to trip you up. The other whispers all the truths and secrets you long to hear, but only when you are listening. 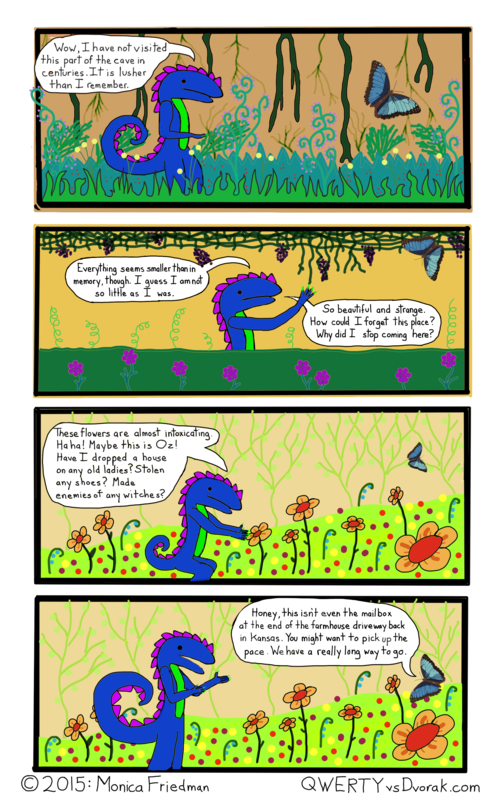 This entry was posted in Comics, dragon and tagged blue morpho, butterfly, colorful, comic, crystal, crystals, dragon, inspiration, quiet, rainbows, talking, webcomic on January 28, 2015 by littledragonblue. This is a small little drawing, I’d say, but it feels complete, for what it is. 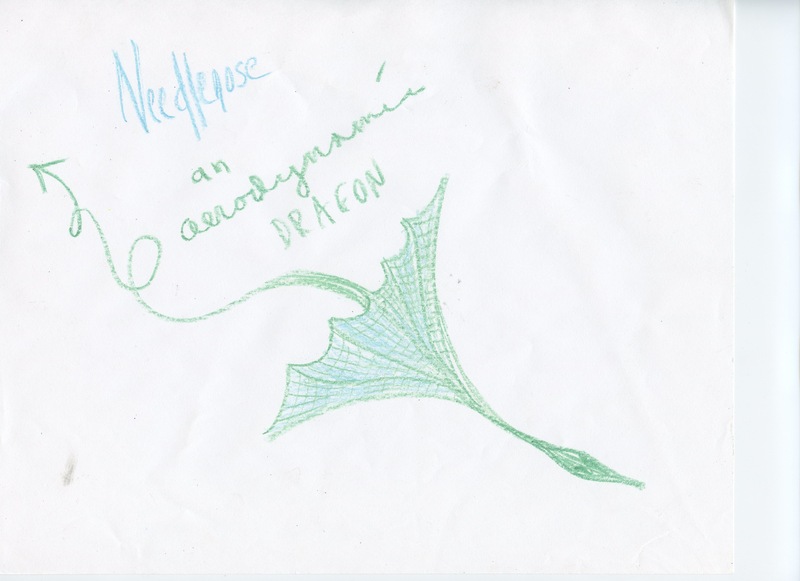 Needlenose, being aerodynamic, requires no extraneous parts or ostentation. There’s something to be said for pared down design and utilitarian simplicity. When I dream at night, my dreams usually unfurl like feature-length reels of film: passion, intrigue, and drama in 3 acts. I am a spy, a soldier, a detective. I travel through time. I change genders, I change age, I change race. I change species. I complete quests and solve mysteries. On the rare occasions that I dream myself back in high school or completely naked, I manage to power through the dream without any noticing that I forgot my locker combination or my pants. My childhood daydreams were even larger. I needed my own island to protect myself from the world. Literally: an island. Specifically: a mansion on an island where I would live in complete seclusion with my books and my faithful manservant. I would write my novels, unaffected by the rest of the world, a one-way system of communication in which my ideas would be received by an adoring public without my ever needing to venture from my protective base. But I know now that what a person dreams and what a person needs are often worlds apart. Needlenose needs no adornments to fly, and I don’t need an island to exist happily in this world. I still dream big. But I live economically. Perhaps my lifestyle is not quite so stripped to the bare essentials as this thin little dragon, but it is richer in art than it is in hard currency, and I’m still creating. This entry was posted in Dragons and tagged crayon, dragon, dreams, fantasy, islant, lifestyle, money, needs, requirements, simplicity, success, wealth on January 27, 2015 by littledragonblue. Are you a good Dragon or a chaotic neutral Dragon? I’m not saying that every successful artist and writer I know suffers from Impostor Syndrome. Obviously, some creatives have massive egos. Then again, some of them evince massive egos to hide from the world the fact that they don’t think they deserve their success. However, I do know quite a few people who have received and continue to receive recognition (positive reviews, regular sales, prestigious awards) and also live in fear that someday the world will figure out that they’re not really that good, and they will lose it all. One problem is that success can be so fickle. After Robin Williams’s death, most of us probably thought first, “But he was so great, so funny.” But some of us probably thought, a little bit later, and with a little bit of guilt, that The Crazy Ones wasn’t great or funny. I had to Google just to remember the name of his last sitcom, of which, like many people, I watched a single episode before making the choice not to follow. And Robin Williams was great. He was funny. But art doesn’t work like that. The emotions Williams made us feel in Dead Poets Society don’t keep The Crazy Ones from getting cancelled. So there is a sense that no success is real success in the arts. You’re only as good as your last performance, and if you’re hesitant to schedule the next one, you’re a has been resting on your laurels. You have to keep producing, and each production has to be better than the last. Every little success is a boost to the creative mind, but the next day is a blank slate. If you don’t sell as many books, if your webpage doesn’t get as much traffic, if your critics are a little bit less congratulatory today than they were yesterday, you only feel the negative. Most of us (the less insane ones, anyway) did not go into the arts for the accolades. Most of us went into the arts because our weird artistic brains literally did not give us any other choice, which makes success, or lack thereof, that much more difficult to process. Even if you’re great, even if you know you’re great, our society doesn’t look kindly on those who go around explaining how great they are. You might feel bad about your success because you want your art to transcend the need for positive feedback, or because there’s something illegitimate about becoming popular. You might feel bad about wanting or enjoying success. Many of us simply believe we don’t deserve to succeed: because we don’t think we’re good enough, because we think others are better, because we feel that we haven’t suffered sufficiently, because we feel like there could be shame is being successful. And then there are those who are afraid to succeed, because to attempt success is to risk failure, and if we don’t believe we deserve to shine, we inevitably keep ourselves in the dark. 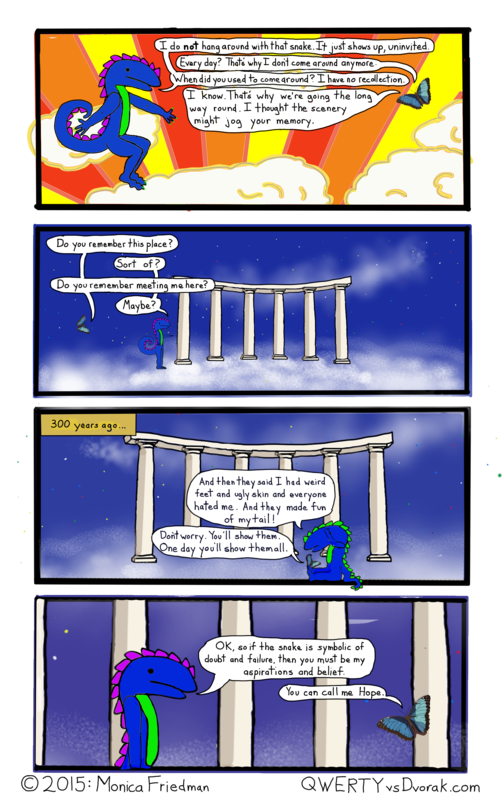 This entry was posted in Comics, Dragons and tagged beautiful, blue morpho, butterfly, comic, dragon, exploration, impostor syndrome, journey, memory, soul search, vision quest, webcomic, wizard of oz on January 26, 2015 by littledragonblue. At the risk of potentially promoting myself or something: more Dragon merch! 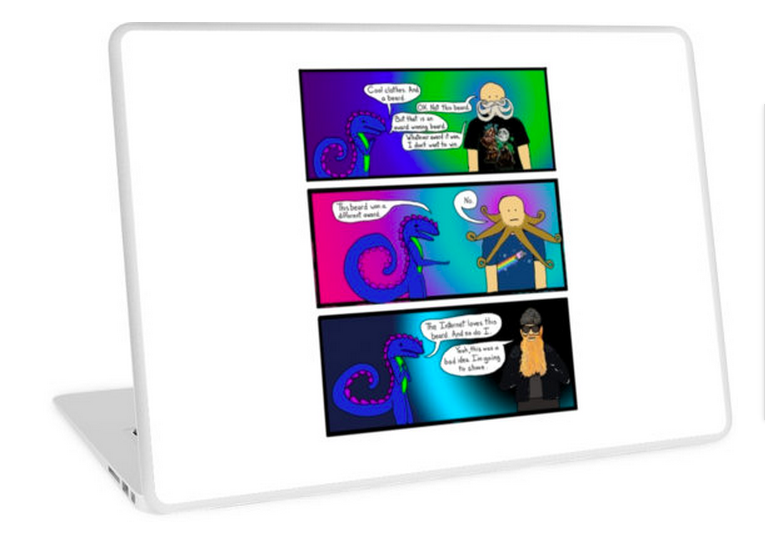 There are 6 new designs in the Dragon Comics portfolio on RedBubble, some of which have been a while in coming. Dragon and The Man beneath the Milky Way looks great on a dark colored background. 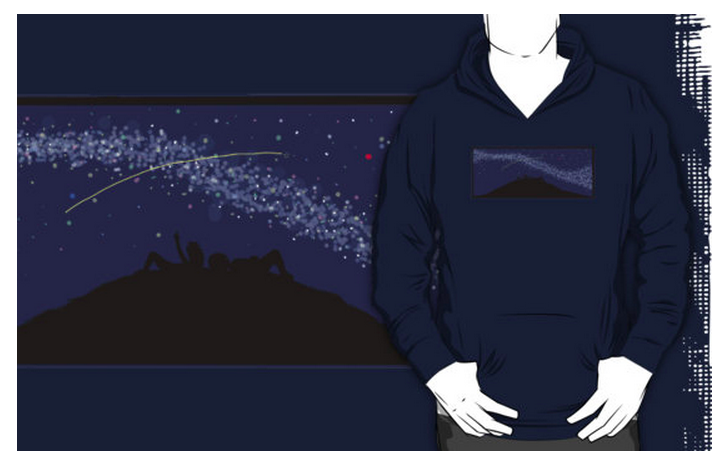 Get cozy with nature as you watch shooting stars arc across the dust lanes. Cool Clothes. And a Beard. Cool Clothes. And a Beard brings together some of the Internet’s most endearing nonsense: 3 wolf moon, nyan cat, international bearding competition winners, and Billy Gibbons of ZZ Top. It’s a water heater! It’s a wankel rotary engine! It’s a solar panel! It’s…The Machine. 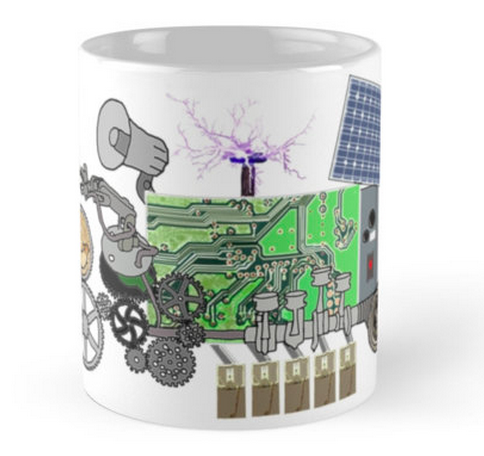 Fuel your machine with this inexplicable contraction on a coffee cup, or advertise the fact that you’re a no-nonsense machine by wearing a ridiculous T-shirt. 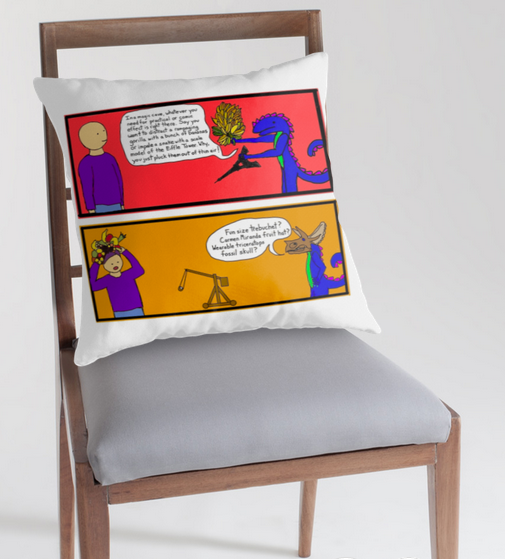 If your sofa needs a little random insanity, Whatever You Need for Comic Effect is available on a pillow. Who needs a bag of many things when you have a magic cave? Carmen Miranda hat, fun size trebuchet, or wearable triceratops head, it’s all within easy reach. 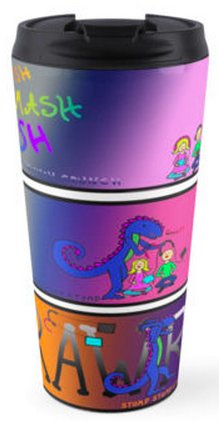 Give in to a little primal rage against the machine with the Dragon Rages against the Kids’ Electronic Devices; take it with you wherever you go with a travel mug. Or get a sticker and slap it on someone’s Kindle screen. That’s all the publicity I have in me right now. Support a tortured artist. 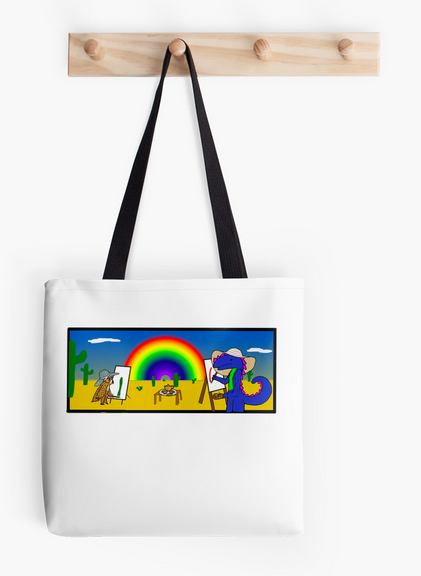 This entry was posted in Clothing, Comics, dragon and tagged 3 wolf moon, bags, billy gibbons, clothing, comics, cool, cool stuff, dragon, laptop cases, merch, mug, mugs, nyan cat, pillows, redbubble, shirts, t-shirts, three wolf moon, tote bags, totes, travel mug, travel mugs, zz top on January 22, 2015 by littledragonblue.